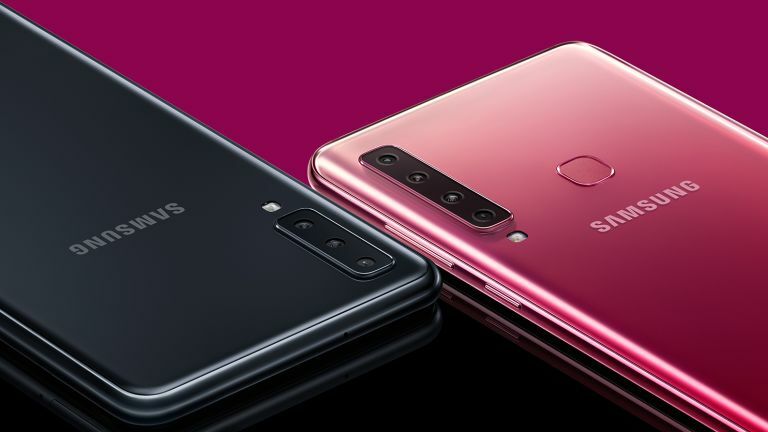 Samsung has announced its new Galaxy A9 handset, which includes a quadruple camera system capable of almost every smartphone photography trick in the book. The new Galaxy will be aimed squarely at the "Instagram generation" when it goes on-sale in mid-November for £549 (roughly $720), Samsung says. Aside from the eye-catching camera set-up, the new phone comes with a rear-mounted fingerprint sensor, contactless mobile payment capabilities, and expandable storage of up to 512GB – all features common to high-end smartphones. The primary camera is a 24-megapixel sensor with an f/1.7 aperture that handles most of point-and-shoot needs. Below that, there's a depth-sensing 5-megapixel lens designed to gather all the depth information needed to add an artificial bokeh blur to the background in Samsung's adjustable Live Focus feature. Next up, there's an 8-megapixel telephoto sensor that should improve the quality of your zoomed photographs, similar to the 2x optical zoom found on the iPhone Xs. Finally, the last camera in the set-up packs an ultra-wide 10-megapixel sensor that provides a 120-degree field of view and should let you capture tall landmarks and big group shots without too much hassle. And that's not where the cameras end, since there is a 24MP front-facing camera with f/2.0 for all selfies and video calls. Speaking about the camera system during the Galaxy A9 launch event, Samsung mobile chief DJ Koh said: "Building on our legacy in smartphone camera development we're introducing next-generation technology across our entire Galaxy portfolio to give more consumers the opportunity to experience cutting-edge innovation. The Galaxy A9 has a 6.3-inch FHD+ screen that Samsung is branding an "Immersive Display", which as far as we can tell is marketing term to differentiate between the dual-curved "Infinity Display" technology found on the flagship Galaxy S9 and Note 9. Measuring 162.5 x 77 x 7.8mm, the Galaxy A9 is actually slightly taller and wider than the Samsung Galaxy Note 9, which has a fractionally bigger 6.4-inch display. Elsewhere, the Galaxy A9 ships is powered by a Snapdragon 660, coupled with a generous 6GB of RAM. There's also 128GB of in-built storage and a sizeable 3,800mAh battery, which Samsung claims is more than enough to keep the handset running throughout the day.